Members may be interested to learn of three plant trials that are underway at the home of Richard and Bronwyn Illman. Based on the experience gained at the conference in Germany earlier this year we have purchased some coarse peat and are trialling mixing this peat with our soil when we plant new rhododendrons or azaleas. There is a horticultural product available for growing Blueberries. This mix has a pH of 4.0 which is very suited to acid loving plants. We have potted some of our propagated cuttings into this mix. Another product used in fruit orchards has been designed to reduce the internodal growth in fruit trees in order to prevent them from growing into anti-bird netting. It is also used by the nursery trade to produce compact and floriferous plants. We have tried this product on two identical rhododendrons planted in the same growing media. 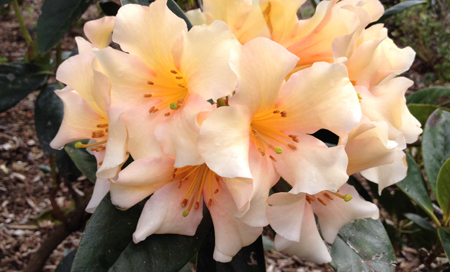 The result has been significant and we believe may have some potential in producing compact standard rhododendrons. We will keep members informed about the progress of all three trials. If you are interested contact Richard or Bronwyn for more information. To read more articles download the newsletter.